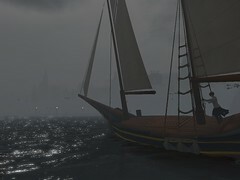 Sailing around on a dangerously foggy night. It’s no surprise that SL crashed on the rocks, and my boat sunk into the inky abyss. Maybe the flotsam will be returned to my Lost & Found some day.